World War II combat veteran William A Foley Jr. is a published author, painter and muralist whose work has been displayed in the D-Day Museum in Louisiana, Pritzker Military Museum in Chicago as well as other art galleries and government buildings around the country. Mr. Foley was a rifleman in the 94th Infantry Division of Patton's Ghost Corps. He uniquely captured the essence of an infantryman's life on the front lines with his incredible sketches from his foxhole during the war as an untrained artist. After returning from the war and attending art school he painted full color canvas works of some of the war sketches. You can see some of these sketches, paintings and read his personal account of World War II combat in his book, "Visions from a foxhole." On this site you will be able to view a majority of the World War II sketches and paintings, as well as other fine art, illustrations, and murals from Mr. Foley's personal collection. We also have links to interviews, video's, and information regarding his harrowing accounts of World War II. 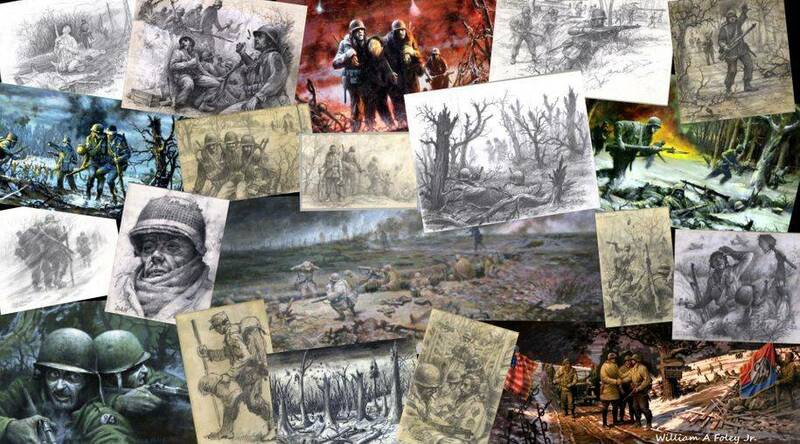 We have also set up an online store for fans to purchase posters of his War Art and other Art from his collections. There are also other gift items for purchase on these sites. Mr. Foley is currently available for speeches and/or book signings. He is also available to commission for murals and paintings. You can contact Mr. Foley through this site for more information. All Illustrations by William A Foley Jr. - Copyright © 2016. All rights reserved. No part of the contents of this website may be reproduced or utilized in any form without the written consent of William A Foley Jr.